Welcome to Musicarta, a collection of piano lessons online and creative keyboard tips and techniques! Where young keyboard players and adult re-starters, songwriters, budding composers and students will find FREE piano lessons online, creative ideas for home study, music theory work-outs and a wealth of starting points for keyboard improvisation. Welcome to Musicarta’s piano lessons online! Musicarta offers a structured and creative home-study approach to popular music performance styles and harmony. For many people – adults with busy lives, young or semi-pro musicians wanting to up their game and anybody living far away from possible teachers, organising your own learning is the only alternative. Musicarta is here to help you succeed – and have a great time doing so! Musicarta has more than a hundred web pages packed with learning material and creative ideas. To help you navigate the site and find the material you need to progress as a musician, the contents are grouped on the main left hand navigation bar (navbar) as follows. First come the 'main course' study courses: All-level courses which combine explorations of the various ways you can put music together at the keyboard with tuneful, modern-styles original repertoire. Below these are the repertoire offerings - Solos Volume One, Mariaan, Chords for Carl and more. These are lighter on the theory. Below these are the various Musicarta ‘assets’ pages and the rest of the admin tabs. Before getting down to thinking in a detailed way about your own possible way forward with Musicarta - we just couldn't help posting a few fliers for our latest Musicarta Publications home study workbooks! Follow the 'Contents/Learn more' links to access the sample content pages. NEW!! 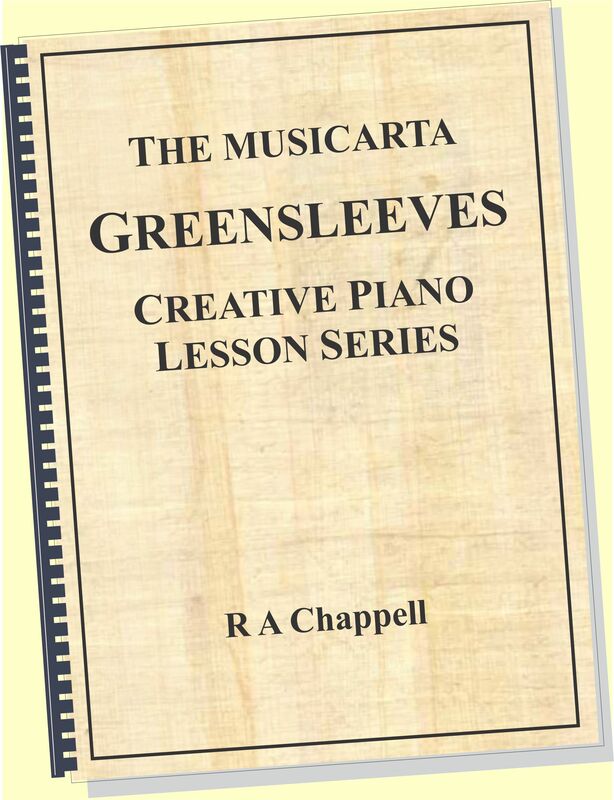 The Greensleeves creative video piano lesson course. Craft your own arrangement of this timeless melody. Click through to the Greensleeves YouTube playlist here. Also available on Udemy and Skillshare. A standalone eight-lesson mainly video course designed to get your own unique arrangement of this beautiful tune into your repertoire quickly and easily. The lessons explore how an arrangement can build in rhythmic and harmonic complexity. Take it as far as you can with an achievable performance every lesson and always something to reach for. Listen to the 'Concert Variations' - one possible medley of the arrangements you might learn. A nice 'time out' for the hard-working classics player, and ideal for adult re-starters. And people never tire of asking you for "something we all know"! Click through to the extensive try-before-buy series sampler page here. Follow those 'Learn more/Content' links to access the sample content pages. Okay, enough advertising for now... Some information. What's in a Musicarta home-study download? Musicarta’s recommendation for getting your own programme under way would be one of the Musicarta digital home-study downloads. .
Play-along backing and drum tracks, coaching videos and other useful resources (see download home pages for exact specs). Latest additions - the Modes and Twelve-bar Piano Styles workbooks - include password-protected web-page modules where you can listen to the example audios and watch enhanced buyers-only teaching videos. On-going explorations at Mister Musicarta YouTube and Soundcloud to keep your interest fresh. Here are snapshots of the six Workbook downloads, with ‘Learn more’ links through to the try-before-you-buy sales and sample content pages. The twelve-bar blues form, in its many guises, has practically universal appeal, and there’s hardly a pop/rock/jazz musician who can’t play along to some extent. With its simplicity of form and driving rhythm, the twelve-bar is an ideal pop-rock musical training ground and a great warm-up for any music-making. Part One of the Musicarta Twelve-bar Piano Styles workbook kicks off with a riff you're sure to recognise straight away – play the first audio and see if you don’t! The music in the next audio clip is generated from the same notes, but re-arranged. Can you hear how it’s been done? The answer is that the thirds in the first example have been 'inverted' into the sixths in the second one. This is what makes Musicarta so much more than just a dry collection of riffs! 'Theory you can use' means you actually learn how to construct (or even improvise) your own music. Part Two of the workbook goes on to teach the harmonic and rhythmic building blocks you'll need for your own ever-expanding twelve-bar keyboard 'chops'. Here are some of the riffs you'll learn. Musicarta looks out for learners at every level! Here's a simple, methodical study to drill the three groups of note you need for any twelve-bar. Twelve-bar styles permeate regular pop music. Here's a twelve-bar riff that's a world away for 'the blues'. The twelve-bar is a great source of impromptu duetting, Here's a big-band style swing duet for a couple of boogie buddies. And here for the diehards is a proper straight-eight driving boogie in the old style! So don't be misled into buying expensive, impossible-to-play boogie transcriptions! Build you own achievable, fun twelve-bar styles from the ground up. Click through to browse the Mister Musicarta Twelve-bar YouTube playlist. Remember - the online workbook has the teaching versions of these public videos! The Musicarta Pyramids Variations aims to exceed expectations by coaching beginners and re-starters to an impressive ‘Concert Performance’ (see the video below) in just eight lessons, with key aspects of music theory explained along the way. 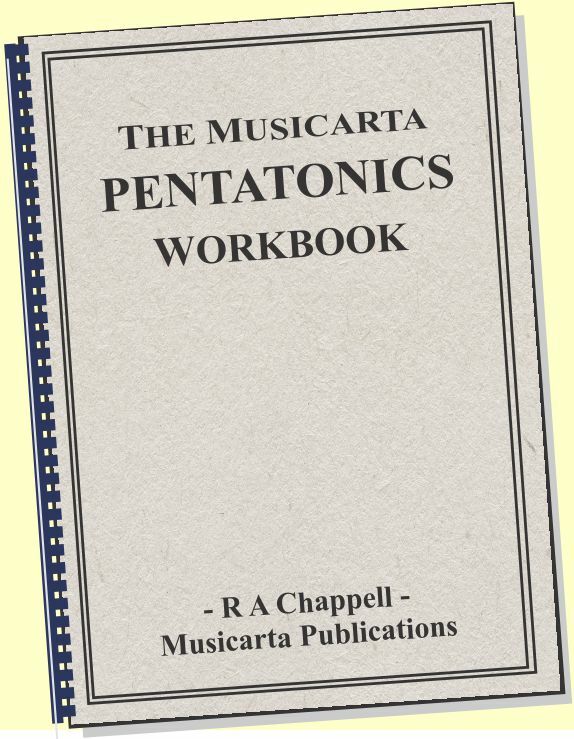 The performances are all based on a simple hand position and the Pyramids Variations work-book is packed with illustrations, so you don’t have to read music to make swift progress. The digital download also has audio and MIDI performances to copy. Now available from Amazon Books. Traditional piano teaching usually works through pieces from the start to the finish – so you can really only ‘play’ a piece when you’ve got to the end. The Musicarta home-study material is structured differently, and builds from simple ‘stepping-stone’ performances to advanced final versions. Listen to these three Pyramids Variations performances to hear how they develop the same basic music from simple to advanced. Practising can easily become a rod for your own back, but with Musicarta’s ‘build’ architecture, you always have the satisfaction of a performance you can be proud of – and encouragement to press on further. Pachelbel’s Canon in D is perhaps the most famous chord sequence of all time, and its regular chord sequence makes it the ideal place to start learning about harmony, how to play a chord sequence, melody writing and improvisation. Orchestral backing tracks are included in the download to support your performance and improvisations and make your sessions at the keyboard a real pleasure. The first two audio samples below are of a learner practising musical elements over the backing tracks, and a fuller performance. First, the string of thirds from the first lesson, played over a backing track. Now here's a two-handed triad improvisation with some 'next-door' notes. Finally, a free improvisation on the Canon chord sequence. The Canon chord sequence forms the basis of numerous other pieces of popular music too, and you’ll be able to apply what you learn in the Canon Project modules to lots of other chord sequences going forward. In fact, if you can play and understand the Canon chord sequence, there isn’t much in popular music harmony you won’t be able to figure out! The third audio sample above shows a possible modern treatment of the Canon chord sequence. The Canon Project also provides an excellent opportunity to develop your musical ear. With practice – and the Canon Project coaching material – you’ll find yourself being able to tell just by listening what chords are being used in lots of mainstream popular music. Watch an improvisation on the Canon chord sequence. Click through to the Canon Project YouTube playlist here. Most of the music we hear is built on just four of the chords in that particular piece’s own key. Guitarists regularly learn these chord families as a matter of course, and seem to be strumming along with the pop classics in no time at all. 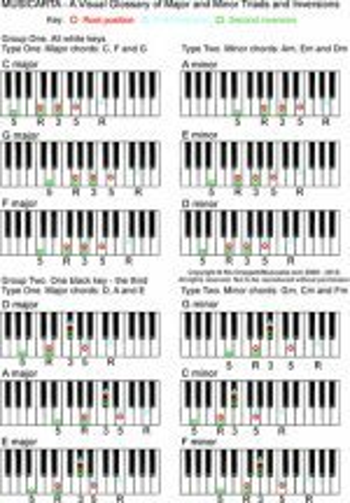 Musicarta Key Chords Vol.1 aims to make it just as easy for keyboard players. 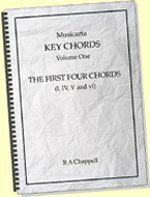 Key Chords builds your chord vocabulary by progressively introducing these chords – the tonic, subdominant, dominant and relative minor (I, IV, V and vi) – and practising changing between them in contemporary riffs, with easy step-by-step rhythmic build-up of impressive keyboard syncopation. Drum backing tracks are included to help keep the notes coming. Here are the exercises for the first two pairs of chords and the first three chords combined. Only a methodical approach like this will give you true creative skill, way beyond copying this riff or that one! Musicarta Key Chords will show you which chords go together – and how to learn them. As you build real hands-on familiarity with the key chord families, you’ll find you start hearing which chords are being used in pop hits, and able to play by ear with increasing confidence. Watch a sample of the Key Chords material. Click through to the Key Chords YouTube playlist. The Canon Project, Pyramids Variations and Musicarta Key Chords Vol. 1 all have extensive free-to-view sample content on the site. Click through to the title home pages using the ‘Learn more’ links or navbar tabs to decide which project is best for you to start with. 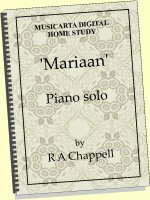 The three major Musicarta study downloads have recently been joined by ‘Mariaan’, a beautiful teach-yourself piano solo. Playing a melody plus its own full, satisfying chord accompaniment is THE benchmark achievement for the modern-styles keyboard player. ‘Mariaan’ builds just such a performance, step by step, and provides a great foundation for mastering solo chord-plus-melody contemporary keyboard technique. This home-study download is designed to fast-track a lovely piano solo into your repertoire, and with its many ‘stepping stone’ performances, it’s guaranteed to expand your creative horizons every time you sit down to play! Watch the final Mariaan performance on YouTube. Also available: 'MARIAAN Lite' Just the music! Chord Study (two arrangements), Mariaan plus Mariaan 2.0, four lead sheets incl. guitar tab. Twenty-eight pages, A4. Musicarta is full of ideas for 'just getting your hands on the keyboard and playing'. (Yes, it can be that simple!) Mariaan is an example of what we call a 'left-hand-over style piece. 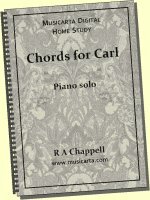 Chords for Carl is another. Watch the Mister Musicarta YouTube performance - and you'll see how one keyboard texture can be turned to a thousand uses - the Musicarta way! MidiPiano is simple to use, and shows the music in the MIDI file being performed on a virtual piano keyboard and scrolling past in a ‘piano roll’ pane as it plays, turning every Musicarta MIDI file into a mini how-to video, so you can see-and-hear what to play. This helps learners who don’t read music well to make good progress – and helps note-bound classical musicians to start ‘seeing the music in the keyboard’! MIDI files are tiny so there’s no delay waiting for MIDI files to load or buffer. Musicarta strongly recommends you take the time to install and learn to use MidiPiano – it will quickly prove an invaluable addition to your learning resources. Here’s a direct link to the preferred download site. (The download folder is only just over one megabyte.) Full instructions and alternative MidiPiano download locations can be found on the site MidiPiano page. Musicarta offers free-to-download MIDI files for selected learning modules. Look out for on-page download links. Please note that MidiPiano is a Windows OS application – Synthesia is a good Mac-compatible alternative. The modes offer the modern popular musician an interesting and productive alternative to conventional major/minor harmony. Many classic popular music chord sequences are drawn from the modal chord families, and the Musicarta Musical Modes series puts compelling modal chord changes under your fingertips in minutes. Here are some typical modal sounds. the first is a Mixolydian two-chord set. Here is a three-chord Aeolian mode set. Here is a minor-mode two-chord melodic improvisation. Modal chord changes have traditionally provided great support for improvisers across many musical genres. An optional theoretical background module opens the series – but you can skip straight through to the riffs if you want. 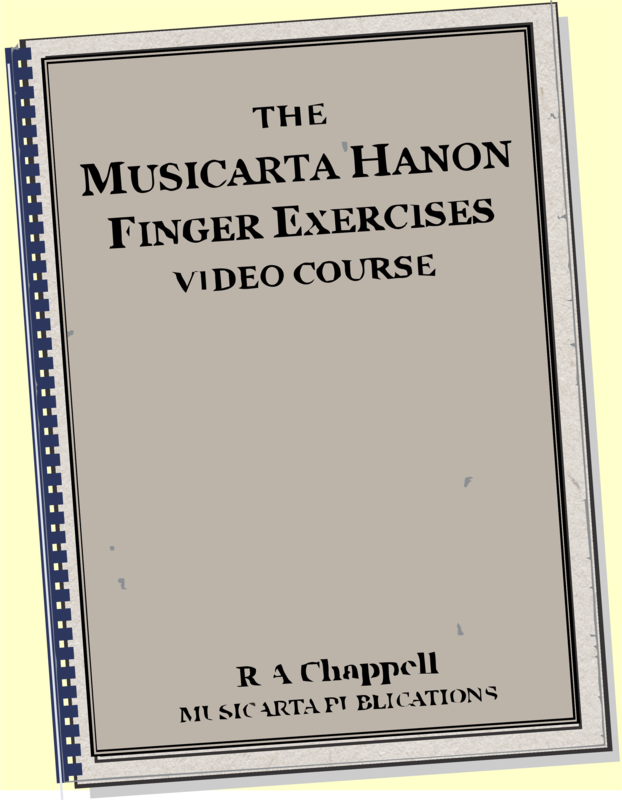 Now a Musicarta home study download with online module web pages. Click through here to start getting to know your musical modes. The Pentatonics tab will take you through to Musicarta’s series of free lessons covering these wonderfully productive and easy-to-learn scales. Blues and heavy metal fiends and rock jammers will soon find that half their all-time favourite solos are built on the pentatonic scales, and find the knowledge and practice material they need to be playing right up there with their favourite musicians. Traditional folk music is almost all pentatonic, and New Age improvisers will find the music pouring out after a few sessions with the Musicarta pentatonic primer series. Here are samples from the three E minor pentatonic riffs in Module Two of the series. Click through here to sample the first pentatonic scales module. Well-developed beat-and-rhythm skills are an essential ingredient of modern keyboard technique, and syncopated hand patterning can generate great riffs from the simplest material. Access these sessions via the Beat and Rhythm home page. Classically trained musicians frequently admire the pop musician’s ability to play by ear or from lead sheets and improvise chord sequences and melodic lines – and today’s piano pupils are increasingly demanding more contemporary content in their lessons. Mainstream classroom and instrumental music teachers will find a ready-made creative lesson component in the three major Musicarta study projects, while many of the site’s other pages will suggest lesson material and ways of making learning more enjoyable and effective. 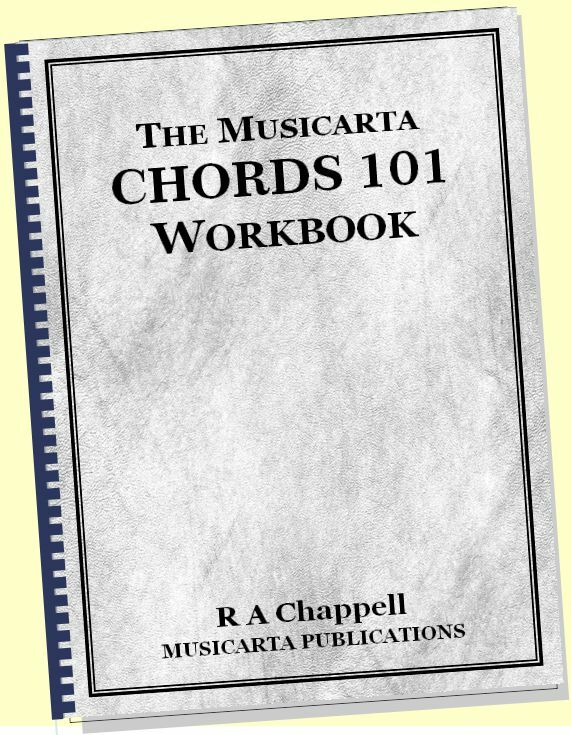 The ‘Chords’ navbar tab will take you to Musicarta’s table-of-contents page for all learning material concerning chords, from a simple explanation about the difference between major and minor chords to an explanation and a drill for mastering sophisticated seventh chords. There are links to Musicarta’s popular Keyboard Chord Generator, which helps you find the inversions of all major and minor triads at the keyboard, simple but effective keyboard drills for learning inversions and practicing broken chord patterns and a selection of keyboard accompaniment patterns – the notes you actually use the ‘play’ a chord. Click through here to the access these free piano lessons online. There are two good reasons for learning and practicing the musical scales. One is to develop finger dexterity; the other is to learn the keys. All musicians should practice playing up and down the notes of their instruments quickly and evenly. Scales offer a perfect answer to the ‘Which notes?’ question and simultaneously teach you the ‘look and feel’ of the advanced keys you need to know if you want to be a ‘real’ musician. The Musicarta Scales page has solutions to take the pain out of learning scales (and keys) – and maximise your scale practice benefits. You can really only say you know a chord sequence when you can transpose it. Similarly, if you want to really know a chord sequence – learn to play it in another key. It’s generally agreed that transposing easily is the mark of a true musician – so the sooner you get started, the better! Transposing needn’t be as intimidating as all that, however, and MidiPiano proves an almost made-to-measure learning aid. Suspensions – the pulling-out-of-place and releasing of chord tones – make chords more interesting, and are a great way of getting more mileage out of any chord sequences. You'll recognise the technique as soon as you hear it - play the practice riff audio below. This focus page explains briefly how suspension-release works and hosts the teaching notes for the various Musicarta YouTube videos with suspensions as their main focus – and hopefully offers a wild-card introduction to the joys of ‘messing around at the keyboard’ generally. Here's a basic suspension-release practice riff. 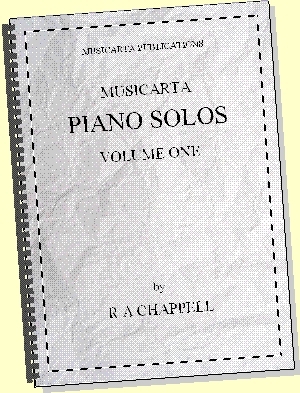 This home page – and the whole Musicarta site – is peppered with click-to-play audio samples of solo piano performances you can learn to play with Musicarta. If you like what you’re hearing, you will find all the ‘how-to’ coaching you need, either free on-site or in the downloads. More importantly, these piano solos are all pure examples of ‘messing around with chords’ in practice, and have been improvised out of the chord sequences explained and worked through in the Musicarta teaching material. So, if you want to compose your own piano music, Musicarta’s methodical approach to keyboard creativity – the most accessible on the web – is right here at hand! Browse the Mister Musicarta YouTube Solos playlist. Enya’s easy piano style and haunting Celtic melodies are a gift to the ‘New Age’ piano soloist. Enya’s standard keyboard texture is easily grasped and a great off-the-shelf way to play any chord sequence. It’s also a great springboard into keyboard improvisation – see the many ‘Enya Studies’ videos on Mister Musicarta YouTube. Here are a couple of audio tracks of improvisations that use Enya's easy keyboard texture. Good interlude music for your school play or home video...! Jann Tiersen’s ‘Comptine’ has become a much-loved classic of its type. It’s within most players’ reach and offers many opportunities for variation and improvisation. Musicarta’s ‘Comptine’ improvisation mini-series shows you how to practice and master this little gem, which should have a permanent place in your repertoire. Musicarta's Comptine improvisation mini-series is one of the many modules with accompanying free MIDI files to download, so you can see-and-hear the musical examples and improvisations playing on MidiPiano or your favourite MIDI application, and double your progress. Why not watch one of the many YouTube ‘Comptine’ videos, download MidiPiano, download the Comptine mini-series MIDI files, open the Musicarta ‘Comptine’ improvisation page and get started right away? Styles is a wildcard creativity challenge page - a score or so of begged and borrowed generic pop styles recordings. This is what pop-rock keyboard players do - how far can you get copying them? Musicarta wants you to be able to say “All the way!” and, with your 100% commitment, Musicarta can show you how! Musicarta knows that keeping your musical development powered up and on track is a mission – and is organised to help you. If you prefer, you can bookmark the Musicarta blog page and read the posts at your leisure. The Musicarta News offers an occasional round-up of developments – plus discounts codes for the home study downloads. Sign up now! There are a few other ways of making sure you get the most out of your visits to Musicarta. You can search the site from any page using the Search tab. There’s an index facility on the Search page as well. Mister Musicarta YouTube (see next section) also premieres new material regularly – subscribe to the channel to receive news of new postings. The Musicarta YouTube channel hosts over a hundred short teaching and performance videos, and is an important part of Musicarta’s educational material. Some of the videos are trailers for Musicarta home study downloads (arranged conveniently in playlists), and there are ‘Diary’ entries also – ongoing explorations of Pyramids and Canon Project material, for example, or the Enya Studies. There are pure theory videos covering inversions and so on, pure performance videos like ‘Mariaan’ and ‘Southern Comfort’, and videos which illustrate certain chord sequences like 'I and vi in Three Places' or harmonic techniques like suspensions. Spend a little time browsing the channel and ‘Subscribe’ to the channel to get automatic notice of new uploads. There’s a Musicarta YouTube links table in the web page right hand column site-wide, too, featuring recently uploaded videos and the playlists. … is a list of compelling reasons to sign up for this occasional round-up of Musicarta news. Sign up now if you haven’t already! … talks you through downloading and installing this indispensable learning tool. … is the place to buy Musicarta digital home study downloads if you have complimentary discount code from the Musicarta newsletter. Sign up now! … is the HTML version of the live-linked PDF site-map you can download using the in the left hand column. … is a collection of Musicarta’s musings on musical education. So, welcome to Musicarta! Please stay and browse the pages via the links in the explanation paragraphs or using the navbar tabs on the left. Bookmark us and come back regularly to see what’s new – you’re sure to find something to get your creative juices flowing!